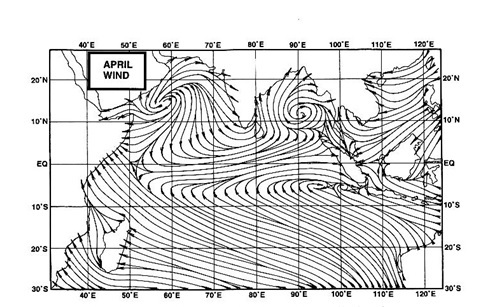 The discussed "low" behaved, and moved westwards across the central regions of India. Rainfall precipitated was good along its path thru M.P.and Gujarat. Amounts in Gujarat varied from 50 mms- 100 mms. All on course as yet, and on the dated schedule too. But, it has to show its erratic erratic behaviour somewhere !So, somehow, the low, and its precipitatation areas just avoided the entire state of Maharashtra (except a days rain in Vidharbh). 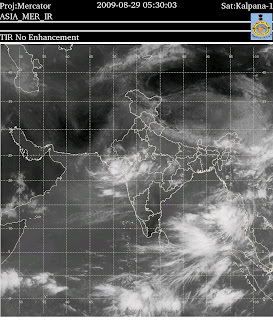 Today, Saturday, the image of clouds shows the low over Gujarat. Cloudes proper over Gujarat, but neatly avoiding Maharashtra ! Good rainfall over Gujarat is being experainced. (This blog is written on Saturday 1 p.m.). The avoidance of clouding and rainfall to Konkan and the Mumbai region is puzzling and confusing. All the known models had forecast good rain for Mumbai on Friday. A resultant vortex near Mumbai was anticipated by me on Friday, but today, the vortex has formed a bit north, in the Gulf of Cambay. As a result, today, there is rain north of Mumbai, from Dahanu northwards, to be precise. A "wagging tail" effect of the low can still bring some meaningfull rain to Mumbai, on Saturday evening. I anticipate the low to move west, and merge in the North Arabian Sea. Central and western India may see less rain for a few days thence. With this system moving away from India, another low is approaching the A.P. coast around the 2nd. of September. How does the upcoming Low likely to affect Mumbai?